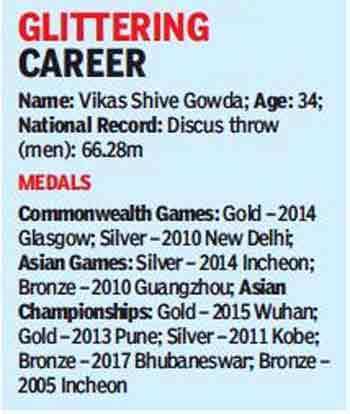 BENGALURU: “The battles that count aren’t for gold medals.” This famous quote from Jesse Owens is surely the one that star Indian discus thrower Vikas Gowda — who announced his retirement on Wednesday — relates to as he battled past many hurdles to win laurels for India over the last 15 years. Despite living in USA from the age of six, Vikas, the towering 6’9” champion who was born in Mysore, always loved to compete under the Tricolour. He ensured that the Indian flag fluttered high during many international meets as he won gold medals, including in the 2014 Glasgow Commonwealth Games and at the Asian Championships in 2013 and 2015. “I was planning to retire after the Asian Games but last week I realized that my body is not responding to training. I was throwing in the region of 61-62m and I was not happy with that. 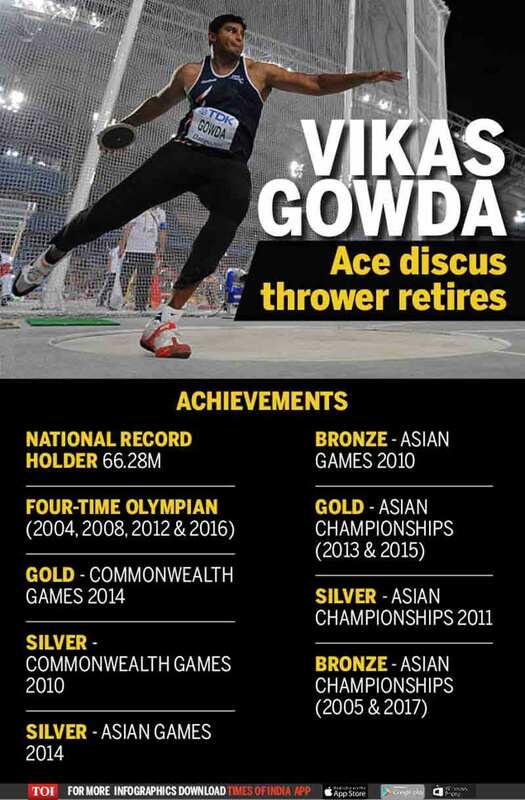 With more load, I could have improved up to 64m but I didn’t want to punish my body anymore,” Vikas told TOI from Maryland, USA. Asked whether AFI’s call to attend the trials hastened his decision, Vikas said “no”. “If I was throwing in the region of 64-65m then I would not have minded flying down to attend the trials. But as I was doing way below my expectations, I didn’t want to push my case. I was training really hard after last year’s Asian meet but in the end it didn’t click,” he said adding that he never had any issues with AFI except during last year. Vikas, who reportedly spent nearly Rs 1 crore per year to fund his training at the World Throws Centre in Arizona, had to repeatedly run from pillar to post to get support. According to sources, his father had to pledge his property to raise loans to ensure that his son’s training went uninterrupted.